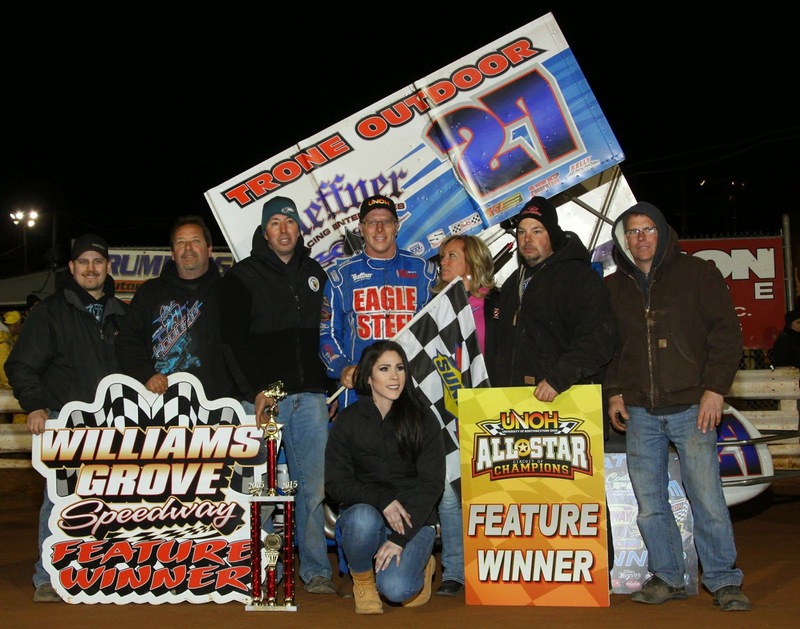 Mechanicsburg – Greg Hodnett scored for the Pennsylvania Posse against the All Star Circuit of Champions Sprints on Friday night at Williams Grove Speedway, taking his first oval win of the season worth $5,000. Hodnett turned back a strong contingent of All Stars in an event that found circuit regular Danny Holtgraver holding the pole position for the start of the 30-lap feature. Only two laps were scored with Holtgraver in control when the races first caution flag unfurled. On the restart Holtgraver held off the advances of Brent Marks to surge out to a comfortable lead with Danny Dietrich, Cory Haas and Hodnett in tow. Hodnett started third in the field but fell backward on the start and nearly spun out in the second turn before settling himself. Holtgraver entered the backmarkers on the 10th circuit followed closely by Marks, Dietrich, Hodnett and now Dale Blaney. And for the next five circuits the front five cars raced within the same set of turns, darting through hectic traffic before all heck broke loose at the halfway point. Holtgraver began fading and Marks capitalized to lead the 15th tour and by lap 16 Holtgraver was back to fifth with Hodnett pouncing on Dietrich for second amid a dizzying pace. Dietrich wasn’t done, instead livened-up by Hodnett’s pass and he pushed his car higher around the oval to reclaim second as the pair dueled for the spot before Hodnett really took hold of the surface in the bottom groove to drive into control over Marks with 12 laps to go. On the 18th lap, the front four cars stacked up top to bottom, nearly four wide in the first corner as each driver fought for control with Hodnett coming out on top in an exciting display of speed and jockeying. But once Hodnett got into clean air he was able to check out on the field, leaving the pack to scrap for what was left of the race. After starting 10th, Ryan Smith bolted into the top five with 10 laps to go and made inroads along with Lance Dewease before the checkers. Hodnett was ready to see the checkers with a lap to go when a final yellow regrouped the field, forcing a green-white-checker finish in which Hodnett took the victory by .683 seconds over Dietrich. Dale Blaney rode home third for a podium finish by the All Stars, followed by Dewease and Smith. Sixth through 10th went to Marks, Stevie Smith, Steve Buckwalter, Cory Haas and Brock Zearfoss. Heats for the 39-car field went to Holtgraver, Haas, Marks and Smith with Gerard McIntyre Jr. taking the B Main. Holtgraver won the dash to earn the pole for the feature event. Hodnett set overall fast time in qualifications with a lap of 16.152 seconds, which was the fastest lap turned at the oval since the imposition of a weight rule numerous years ago. The time was the fastest turned in at the track since Sammy Swindell came in with a time of 16.175 in October of 2011. Les Hare wired the field for the win in the 358 limited late model main event to close the night. Cam Zeigler, Shaun Jones, Justin Ehrhart and 16th starter Wes Alleman completed the top five. Heats went to Sam Gallagher, Alan Sagi and Ehrhart.